If you live in or near Ford End you may like to be a member of the Fordenders Facebook page. 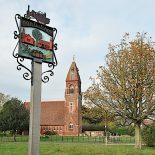 The Fordenders Facebook page is a great place for sharing news or concerns, advertising local businesses and services, updates on church services especially around the holidays, and organising village events. This entry was posted on January 28, 2017 by Fordender in Uncategorized.